That's just a little bit weird, isn't it? 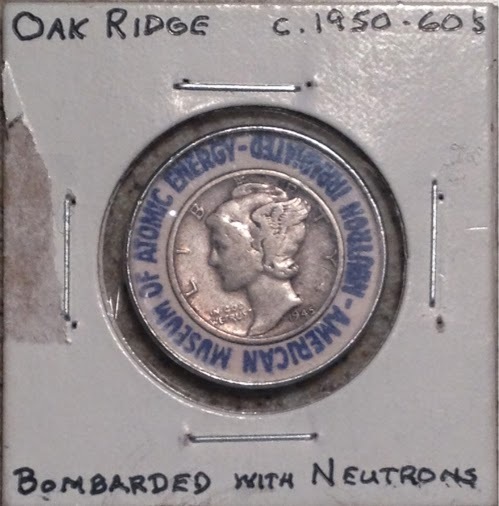 In the 1940's and 50's, a visit to the American Museum of Atomic Energy in Oak Ridge, Tennessee might have including obtaining an irradiated dime like this. Apparently it was quite popular: a 1954 statement said "more than 250,000 dimes have been irradiated, encased in plastic and returned to their owners as souvenirs." I don't think many would do that today. We couldn't anyway as this required silver dimes, but I think most of us would question the wisdom of willfully exposing ourselves to radiation, regardless of how low and how safe it was promised to be. No, this dime should not be radioactive to any detectable extent. Read more at Irradiated Dimes.